In the same installation, goods of different turnovers can co-exist, classified on the basis of consumption criteria (type A, B, C). Taking this fact into account, and factors such as capacity or required installation flows, each product should be deposited in a different storage system based on their characteristics. Automatically, a question arises: what is the ideal system? In reality, there is no exact rule to determine the most appropriate solution, but there are factors that influence its choice. The best storage system is one that responds to the needs and constraints of each particular installation, in the most cost-effective manner possible. Number of pallets per SKU. Operations in general, i.e., the flow of goods. Handling machines available or that have the possibility of being replaced. In addition, it is essential to understand the features and benefits of each system to find the one that matches up with each warehouse. Solutions can be grouped into either direct access or high-density applications. Direct access racks are characterised as such because the products are in the working aisle. In this way, they confer a great agility for managing goods and an optimal occupation of locations is attained, to the detriment of greater surface exploitation. For that reason, storage capacity is less compared to other systems. Direct access is advisable when you have many SKUs and few pallets of each one of them. On the other hand, high-density systems attain greater surface occupation and therefore more storage space, is spite of losing accessibility to load units. Some systems may offer little agility in its operations and tend to have less effective capacity. High-density storage systems are appropriate if you house few SKUs and many pallets of each one of them. In some cases, it is necessary to separate the product by consumption criteria; therefore, you can combine different storage systems. A company’s ultimate goal is to be competitive with minimal operating costs, so it is essential to implement the ideal solution with the lowest return of investment time. Conventional racks can be installed in double-depth configurations. Two pallets are accessible on the same side of the aisle, one placed behind the other. The racks have a wide variety of accessories to suit any load unit type, such as pallets, drums, coils, containers of different forms, profiles, goods on shelves, etc. 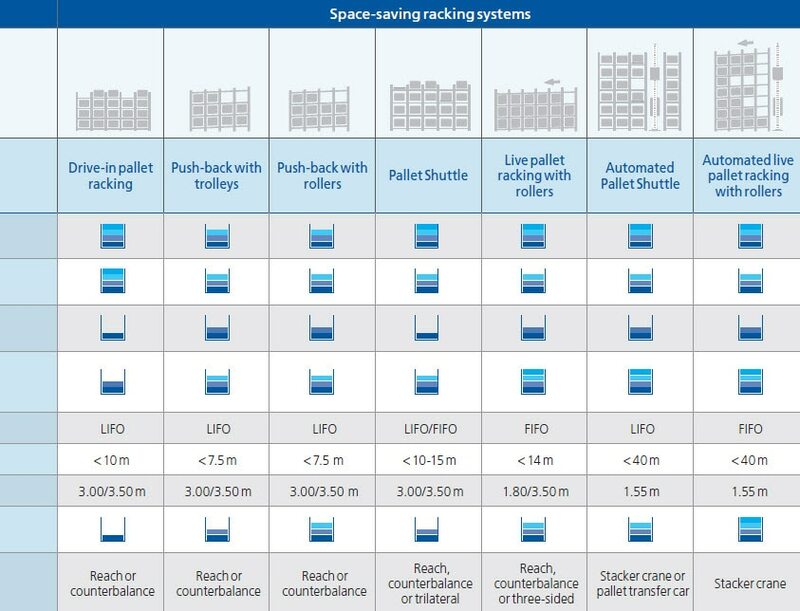 Conventional racks are recommended when it is necessary to perform picking operations directly on the lower levels, for installations with bulky items, or in small warehouses with high consumer products and few pallets per SKU. The type of handling equipment used determines the aisle sizes and racking heights, which generates greater or lesser storage capacity. However, in some cases it is to the detriment of the system’s agility. In the following pictures, the effect of incorporating different equipment is compared. Stackers are one of the simplest handling equipment; therefore, their functionality is limited and they are often used in very small warehouses or as supplements to other machinery. They need 2.20 m wide aisles. Likewise, the front entry, counterbalanced forklift is characterised by its simplicity and agility, although the electric version is the most suitable for working inside warehouses. It requires a working aisle that can range between 3.20 m and 3.50 m. This solution offers little capacity, by the scant optimisation of floor surfaces and space at heights, as they are never more than 7.5 m high. In contrast, reach trucks allow maximum storage capacity. Aisles are narrower (between 2.6 and 2.9 m) and the racking levels higher (can exceed 10.5 m). In this way, it makes better use of the space and height. Reach trucks are the most commonly used handling equipment in medium and large warehouses. On the other hand, bilateral or trilateral forklifts are used in particularly high conventional racks that reach a height of 15 m. They work in even narrower aisles (between 1.5 and 1.8 m), which maximises storage capacity. Their greatest disadvantage is that they are slow and dangerous in shared areas. In that case, it is recommended that other equipment perform movements between the conveyors and the other areas of the warehouse. Their advantage is that they achieve space savings and a considerable increase in the storage capacity by requiring fewer working aisles. It is also true that its use is quite limited due to system restrictions, mainly the low load capacity at higher levels. When it comes to installing double-depth racking, it is necessary to know the deflection of the forks once they are extended and loaded. As such, it is likely that clearances at higher levels must be greater than in single-depth facilities. In principle, extendible forks can be placed in the different forklift models, but the most commonly used are the retractable type. Moreover, operator visibility decreases the greater the height. Cameras must be attached onto forklifts to facilitate vision and prevent accidents. Racks are placed on mobile bases which move sideways autonomously along the rails. This system enables space compaction, with a single working aisle to access the racks. 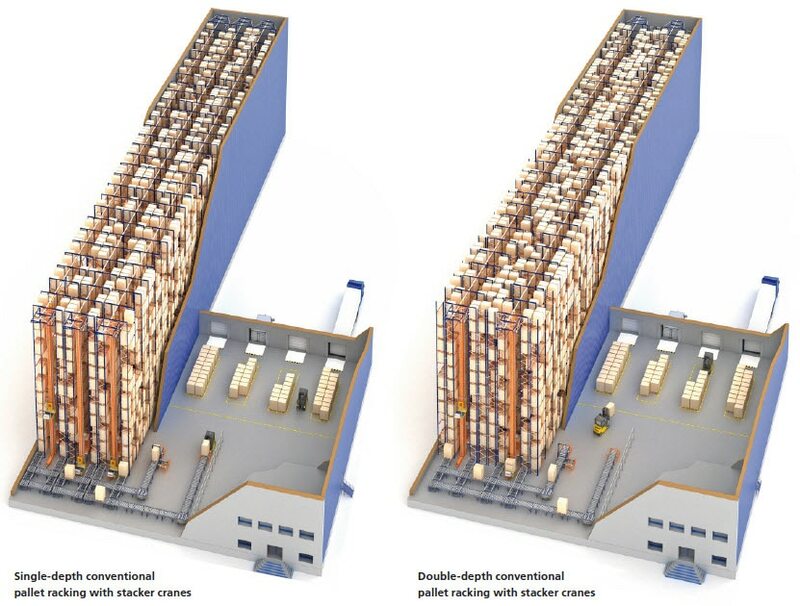 As a result, an increase in storage capacity of between 80% and 120% is achieved with respect to the static racks, at the expense of a less agile operation. 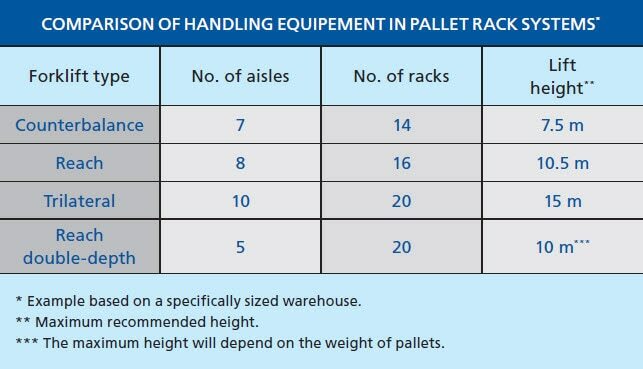 Depending on the number of pallets that have to be moved and the number of forklifts that operate at the same time, the number of necessary aisles is determined. If you compare the images, you can see that with only a single working aisle maximum capacity is obtained, but with two or more greater agility is garnered. It is a highly recommended solution for the storage of low turnover (type C) products and, which must remain a time without moving – in quarantine –, pending the implementation of quality controls. Mobile racks are frequently used in medium and small sized cold storage (refrigerated or frozen). Cold storage provides a sizable and permanent energy savings due to the optimal distribution of cold between the pallets. This is the easiest and most economical option of all the high-density systems. It is composed of a set of racks that form aisles in its interior, which have support rails. All levels of each aisle must accommodate the same SKU. It is ideal for use with high consumption products and when rotation is not a priority. 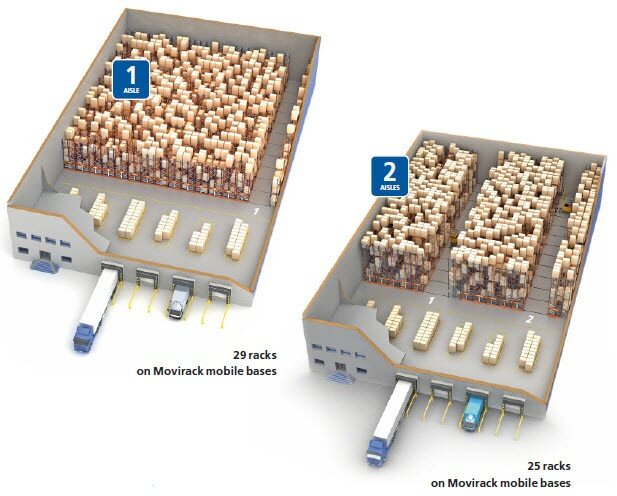 Storage capacity is higher than in conventional racking; however, more manoeuvring time is needed, as handling equipment should enter the aisle interior to deposit or extract the pallets. When designing the installation, a suitable depth should be analysed: the higher the lane, the more capacity is obtained and the fewer number of aisles required, but this also increases handling times. 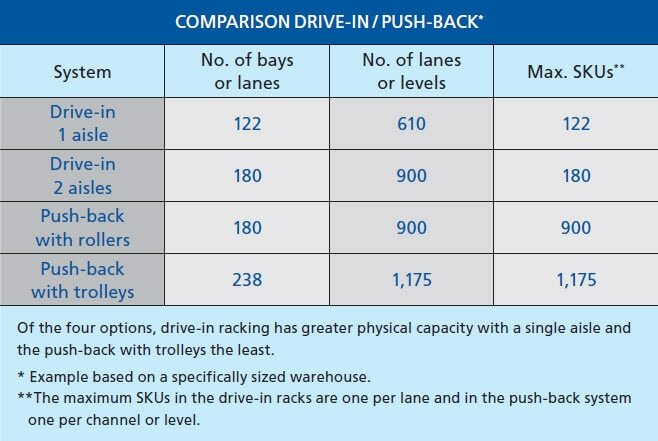 When more access aisles are opened, more agility is gained in the handling of load units, despite reducing storage capacity. 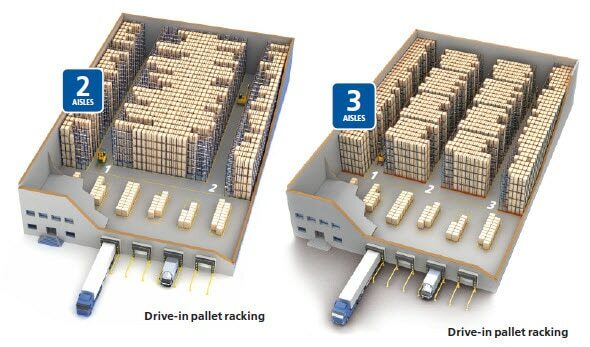 There is the possibility of installing drive-in racks with different distributions depending on the management needs of the goods. Unlike the drive-in racking, each level is independent and can accommodate a different SKU. Therefore, they are very suitable when medium consumption products are stored. Handling times are much shorter, because it is not necessary that forklifts enter the aisles to collect or deposit the pallets. The system is based on racking, which has a strip of rollers or a few trolleys that move along the rails on each lane level. The strips are placed on a forward incline in order to use gravity flow, so when removing the pallet closest to the aisle, the rest move forward, leaving a new load unit available for extraction. By using trolleys, levels of up to four pallets in depth can be installed. 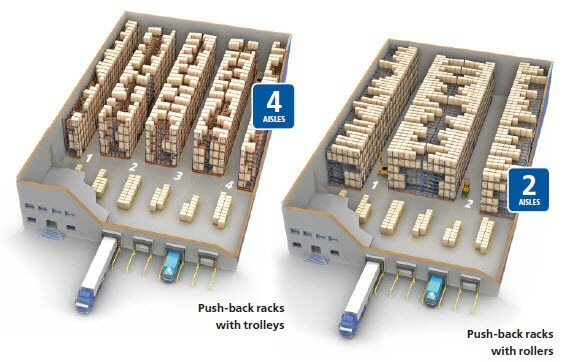 In contrast, with rollers it is possible to locate between six and eight pallets depending on the weight. In the push-back system, you can store as many SKUs as channels available. This system benefits from some of the advantages of push-back racks: each channel allows the location of a different SKU and forklifts do not enter the racks, but it is the motorised shuttle, which performs the movements inside the channels. Its main advantage is that aisles can exceed 40 m in depth. For that reason, it leverages the space better and optimises storage volume. With the help of reach trucks, operators place the motorised shuttle in the corresponding channel and deposit the pallets in the first rack position. Then the Pallet Shuttle moves directly and autonomously to the next free location. To extract the goods, the same operation is done but in reverse order. The Pallet Shuttle is a good solution for high turnover products, with massive inputs and outputs. In the first place, if you choose a single block and a single working aisle, this achieves maximum storage capacity with multiple channels for a single SKU. For this reason, this system is recommended when there are few SKUs and the number of pallets of each of them is very high. In addition, it offers direct access to all channels and streamlines the trajectory of the forklifts. At the same time, racks can be installed on both sides of a single working aisle. A greater number of storage channels are acquired – albeit shallower –, with more effective capacity and better exploited locations. Finally, a single racking block with two access aisles, one entry and one exit, can be installed. It is perfect when the warehouse operates by the FIFO (first in, first out) criterion. However, effective storage capacity is diminished, since channels are not re-filled until they are completely empty. The Pallet Shuttle could relocate pallets, but it is impractical. 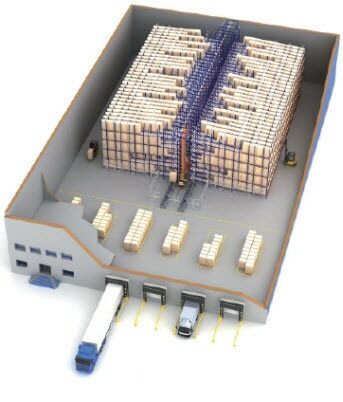 This system ensures FIFO flow without losing effective capacity: when the first pallet is removed, the others automatically move a position by gravity. It is often used for high turnover products, be they perishable or high consumption with a continuous flow. It takes advantage of the available space, with lanes that can be more than 20 m deep. The handling of pallets is very agile: they are put into the load aisle, glide by gravity to the opposite end and are ready for extraction. The space savings, the reduction of the manoeuvring times and the virtual absence of maintenance enable a rapid return on investment. Automation is the evolution of traditional systems. It replaces forklifts and the personnel that handle them with stacker cranes, conveyors and/or transfer cars. There is the possibility of automating warehouses that are less than 15 m high, and thus replace bilateral or trilateral forklifts with stacker cranes and achieve greater productivity. Nevertheless, it is more common to install long, tall warehouses – today they can be 45 m high –, so that the cost per pallet is less and the total capacity increased. 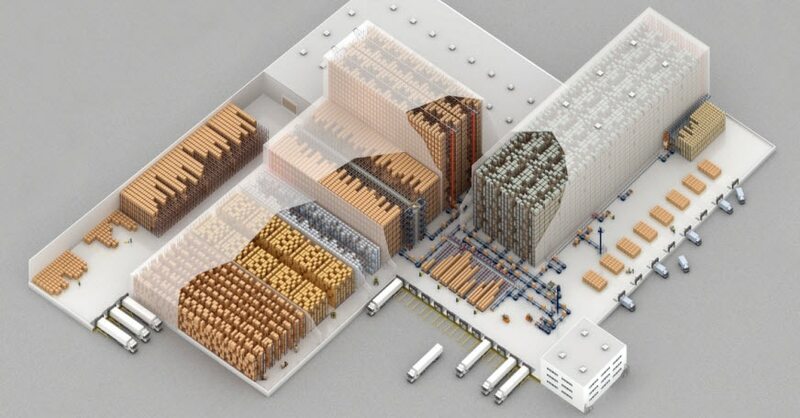 When building an automated warehouse, the ideal is to have enough length and height at hand. This maximises the built-up area, hence greater storage capacity. Both productivity and management improve thanks to automation. Depending on the flow of movements inside the warehouse, single or double-depth racks are installed. Single-depth offers fast and direct access to the pallets, because all the load units are positioned next to the aisle. Therefore, the deposit and extraction process is more agile. This is recommended if there is a wide variety of SKUs. On the other hand, double-depth racking significantly increases capacity and reduces the number of aisles and, thus, stacker cranes. This also entails a decrease in the initial investment concerning single-depth solution. A warehouse with live pallet racks can be automated with the installation of a stacker crane in the centre aisle, benefiting from the great merits that this represents. For example, the increase in capacity due to height growth and to the width reduction of the aisles. Automation is particularly appropriate for high consumption, constant production and with very high turnover products. This solution is also used as an intermediate buffer, between the manufacture and the dispatch area. The solution represented in the image is ideal in warehouses with continuous input from production areas with intensive timetables. Operators use fork lifts to perform outputs during work hours in the dispatch zone. A warehouse with the Pallet Shuttle system serviced by automatic machines benefiting from the merits of full automation. You can choose between two solutions with varying uses and assets: the stacker crane or the transfer car. The choice between the stacker crane and the transfer car will depend on the number of SKUs, the quantity of pallets available and mainly the number of cycles to perform. When installing a single central aisle for the entry and exit of goods, the available space is maximised and you obtain greater capacity. Automation is advisable to achieve a significant increase in productivity, and when the movement of a large number of pallets per hour is needed. The stacker crane or transfer car can circulate in the aisle on each one of the levels. If the images are crosschecked, it can be seen that both cases have a very similar number of locations. The difference lies in how having the transfer car in front of the stacker cranes affects the potential to move pallets. In these two examples, the combination of the Pallet Shuttle and a transfer car on each level allows a significant increase in the number of cycles. Even so, an intermediate solution can also be used that consists in installing two or more aisles. In this case, the lanes are shallower, thereby reducing the warehouse capacity. However, this doubles or triples the agility and the potential of movements. 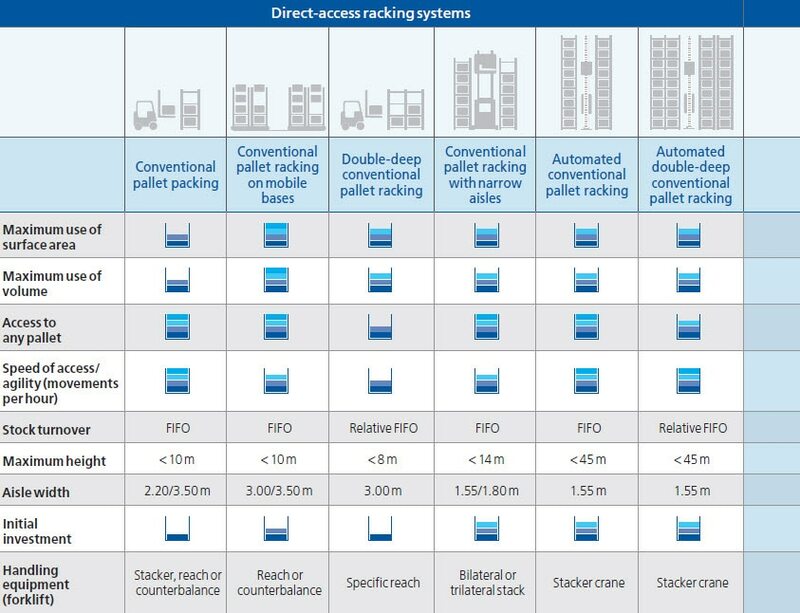 The following table shows a schematic comparison between the different pallet rack solutions – direct access, high-density and automated – and the requirements that have greater influence. 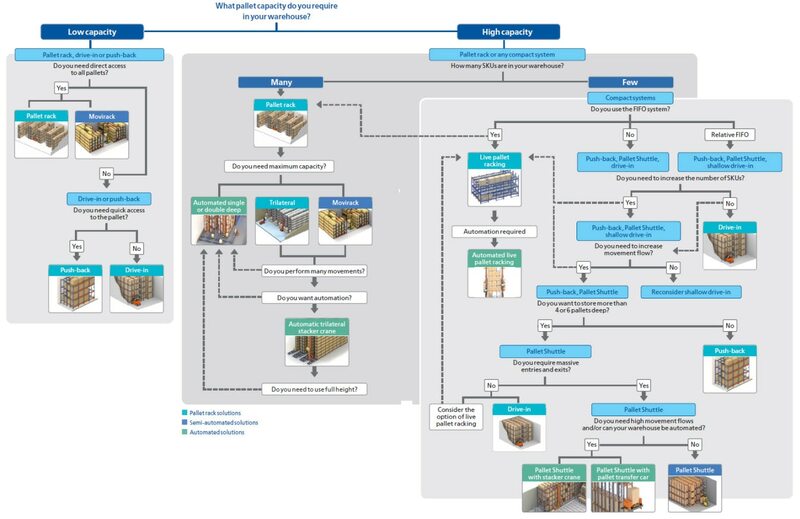 This diagram graphically represents the main data that should be analysed to design a warehouse. It is important to stress that many of the concepts expressed in the table are relative and must be assessed alongside other factors, depending on the logistics required for each installation.